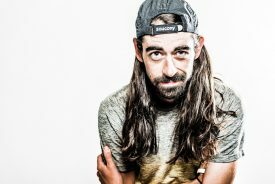 (INDIANAPOLIS – September 26, 2018) – Noah Droddy, Indianapolis-native and now a viral sensation in the running community, will headline the featured speaker series at the Monumental Health and Fitness Expo the night before the 2018 CNO Financial Indianapolis Monumental Marathon. Droddy grew to huge popularity in the running community after appearing in the 2016 Olympic Trials. Since that appearance he has gone on to be featured in ads for both Pizza Hut and Saucony. He is scheduled to take the stage on Friday, November 2 at 5:30 PM in Expo Hall A of the Indiana Convention Center. Noah Droddy, 28, grew up in Irvington on the near Eastside of Indianapolis. He began his running career while in high school at the International School of Indiana. While he never qualified for the State meet, he would steadily improve and go on to run at DePauw University. Garnering two All-America awards in cross-country and a school record in the 10,000 meters, Noah graduated in 2013. By November of 2015, Noah decided to go all in on running, with the goal of qualifying for the Olympic Trials in the marathon. Shortly following a move to Boulder, Colorado, he would go on to do just that. Later that year he would also improbably qualify for the Olympic Trials in the 10,000 meters (he had already bought tickets, as a spectator), and finish second in the US Championships over 10 miles. Soon after he set his half marathon best in New York, at 61:48. Droddy signed contracts with Saucony and Polar and now competes as a full time professional athlete. He currently lives and trains in Boulder Colorado with his girlfriend Emma, and Greyhound Sarah. Droddy has competed in the CNO Financial Indianapolis Monumental Half Marathon previously (2014), but will take on the role of pacer at the 2018 event. He is scheduled to lead the elite men through at least 10 kilometers of the half marathon at the qualifying time for the 2020 U.S. Olympic Team Trials – Marathon (1:04:00) His current personal best is 1:01:48, set in the 2016 New York City Half Marathon. The 2018 CNO Financial Indianapolis Monumental Marathon, Half Marathon and 5K expects over 17,000 participants on race day. The 11th annual event takes place on Saturday, November 3, 2018.